Hari draws is creating content you must be 18+ to view. Are you 18 years of age or older? I’m Hari, I'm an illustrator and comic artist who spends most of their time making LGBT+ fantasy comics. Right now I'm working on Finding Home, an award-winning slow-burn romance, which is so far 250+ pages long and just over halfway through. Support from Patreon is incredibly helpful to me!! I currently have severe chronic health problems which affect my mobility, muscles and energy, leaving me bedbound almost all of the time (I draw with a tablet lying down!) This makes it difficult to take on a lot of client work, so most of my income is from my comics, store and reader support. Patreon lets me spend more of my time to making comics, and gets you access to early pages, special extras and more. 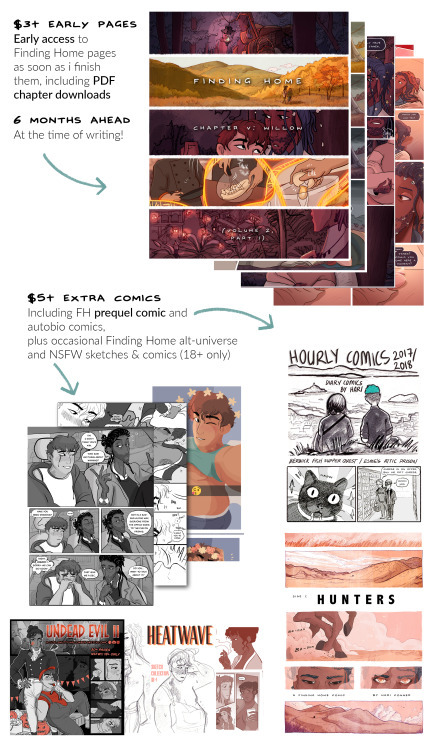 If you like my work and want to help me make it, Patreon is the best way of doing it! Finding Home is a (multi-award-winning) 16+ romance/drama comic exploring mental health recovery, relationships and nature. At the time of writing, the full story is currently about 280 pages in and Earlybird Patreon supporters are more than 90 pages ahead. - Plus sketches, sneak peeks, worldbuilding and process posts ($1). I’m really excited to tell this story - it’s a big, ambitious project that will take a lot of work, and your support is really appreciated. As well as Finding Home, my Patreon also includes my general sketchbooks, process & development, including illustration, RPG drawings and work towards other books. Completed summer 2017: Nyx in the Overworld, a finished, 200+ page, videogamey fantasy comic set in the same universe, but with a fun story for all-ages readers. This started as a webcomic made with the help of supporters on patreon, and is now a book. - Into the Dungeon (a choose-your-own-path gamebook). 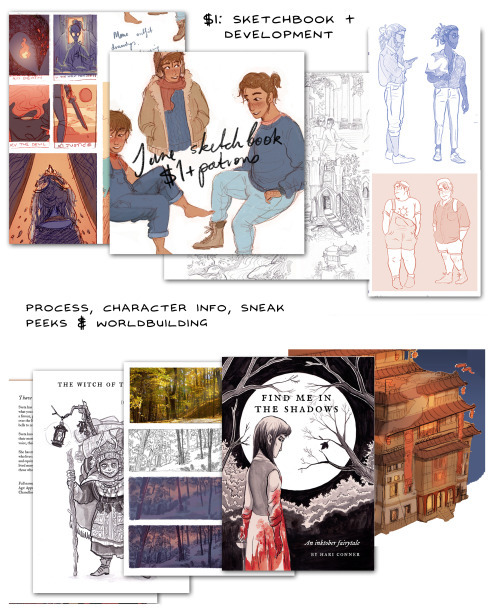 Supporting on patreon also gives you access to exclusive sketchbooks, process and worldbuilding info, updates and sneak peeks, as well as Finding Home pages months before anyone else and whole downloadable comic PDFs. Plus sneak peeks at other projects, comic pencils, process, character & concept art. Early access to pages of Finding Home, as soon as I finish them. Full chapter PDFs available to download when each chapter finishes (in the 'finding home chapter' tag) so it's easy to catch up/read all at once. (At the time of writing, patreon pages are 9+ months ahead of the public webcomic - patrons at this tier get access to them all, straight away). I'll do a session of sketch requests from patrons!